The events of the last week have been a sobering reminder of the bloody toll that continues as a result of the unresolved Israeli-Palestinian conflict. But while Israel looks yet again to her security, on yet another border, Israelis are continuing their democratic life undeterred. In just over a week, on September 3, one million Israelis are expected to go out into the streets to stand for values that we also believe in -- social justice, equality and democracy. Here’s our chance to show them we are aware and care: NIF is collecting signatures from supporters of Israel worldwide, to be published in a large circulation Israeli newspaper the day before the scheduled demonstration. Add your voice. Show your support for a better Israel. One million is a huge number. It’s more than 1 in 8 Israelis. A month ago it would have seemed impossible. But we’ve seen wave after wave of Israelis coming into the streets. 20,000. Then, 150,000. Then, 300,000. The sense of excitement, of empowerment, is palpable. Even the terrible events in the south of Israel have not deterred the movement. Israelis from all walks of life -- secular, Orthodox, Ashkenazi, Mizrahi, Arab, immigrant, residents of Tel Aviv and the periphery -- have already come together as never before. An important goal is being achieved: a critical mass of Israelis mobilising in a campaign for social justice. The seeds have been planted, and a new reality is being created. Stand with the Israeli people. Speak out. This is not just about numbers. It’s about a re-awakening of the values that Israel was founded on -- values that you and I share. It’s about shifting priorities. It’s about quality of life for average Israelis, and about a nation that invests in its future. It’s about social justice. It’s about democratic participation. It’s about strengthening Israel as the moral, just society we all want it to be. Let’s prove that thousands of us, living overseas and loving Israel, agree. 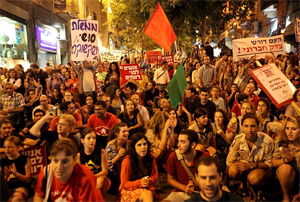 Our colleagues in Israel, and dozens of the groups NIF supports, are working night and day to help the protesters. NIF is providing emergency grants, organising assistance, legal advice, workshops on peaceful protest. And our colleagues in the United States, Canada, the United Kingdom, Switzerland and elsewhere in the Diaspora are supporting the people in Israel through this petition. This petition is another way to help. Some people worry that the Israeli-Palestinian conflict will get in the way. But Israelis themselves are showing that, while the maintenance of security and the pursuit of peace are vital, at the same time, Israel can’t afford to put off meanwhile the question of justice at home. Residents of Sderot, Ashkelon and Be’er Sheba face housing shortages and economic injustice every day, whether or not bombs are falling. That’s a key message of the movement. And it’s something we all know is true. Be a part of a movement that is changing and inspiring Israel. Sign your name. Do it now. The ad runs next week. After signing the petition, if you wish to donate to NIF Australia, please visit this page. P.S. -- After you’ve signed the petition, please forward this email to your friends and family. Supporting this movement is something that all of us can do.